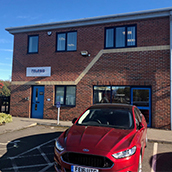 Telesis Marking Systems has its head office at Unit 2, Diamond House, Reme Drive, Heathpark Industrial Estate, Honiton, Devon EX14 1SE. Telephone 01404 549139 or email uksales@telesistech.com. Suite 1 Rotherside Court, Rotherside Road, Eckington, Sheffield S21 4HL. Telephone 07900 435098 or email andrew.ratcliffe@telesistech.com. Telephone or Email to discuss a high quality solution to all of your marking, stamping, etching and engraving requirements. Our Area Sales Managers and our Service Engineers cover the whole of the UK and Ireland and can offer On Site Demonstrations, and On Site or Return To Base repairs, servicing and maintenance, as required. 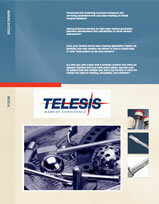 Telesis is the leader in Product Identification and Traceability Technology. Our wide range of permanent, programmable, TELESIS® Lasers, PINSTAMP® Dot Peen, and TELESCRIBE® Scribe Marking Systems are fast and durable. They are relied on in thousands manufacturing environments every day, throughout the world. ALL Telesis systems - whether standard or custom engineered - are backed by a global network of knowledgeable Sales and Service Professionals. Telesis Marking Systems in the NEWS. TELESIS' line of CO2 and Diode-Pumped Laser Marking Systems offers the ultimate in high-speed, high quality product identification. Manufacturers of delicate plastic products, ceramics, glass or medical instruments can mark virtually any material with text, bar codes, 2-D* codes, logos and graphics. Program design for any of our lasers is easy with specially designed, Merlin®II LS visual design software. Unique to Telesis, it's based on the Windows® platform and features user-friendly, drop-down menus and popular graphic interfaces. It is also available in an AMI version (Automated Marking Interface) to address the needs for a safe, easy operator interface for factory automation applications without the need of a keyboard. The TELESCRIBE® is well-suited for VIN Marking. It inscribes high quality, continuous line characters in materials from plastics to hardened steel - in virtual silence. Other PINSTAMP®-based marking systems include BenchMark®, a low cost benchtop marker for individual or small run applications. All of our systems - standard and custom - are designed and built to your specifications at our 46,000 (4274 square meter) square foot facility located in Circleville, Ohio. We maintain state-of-the-art manufacturing tools for all of the mechanical, electrical and software functions needed to support your marking system. Telesis maintains Sales & Distribution Offices in The Netherlands, Germany, Russia, England, and China. 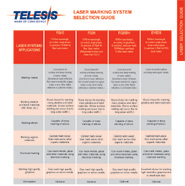 Telesis Pinstamp marking systems and laser systems are listed on the GSA Schedule, contract number GS-25F-0042R. For any questions regarding our participation in the GSA Schedule, please contact Debbie McDaniel at +1-740-420-6551.